The Rockford IceHogs had a six-game win streak snapped Saturday night at the BMO Harris Bank Center. The recent success of the ‘Bago County Flying Piglets has brought at least a smidge of hope to an appearance in the Calder Cup Playoffs. …if the season ended today (which it won’t), neither the Hogs or the Ads would qualify for the postseason. Texas is in that fourth position due to its .531 points percentage, the stat that decides the highest-ranking teams in each division. In case you are unaware, several Pacific Division teams play 68, not 76 games over the course of the season. This necessitates the use of the points percentage statistic. Since it ranks the teams regardless of how many games in hand one team may have on another, I choose to set the standings in this fashion. I guess points will eventually matter in the Central Division after the final day of the regular season. Until that day arrives, I will report the standings (as I have for some time now) according to points percentage. So Rockford is tied for fifth, not fourth place. I am killjoy, hear me roar. Actually, there is a lot to be excited about here on our stretch of I-90. 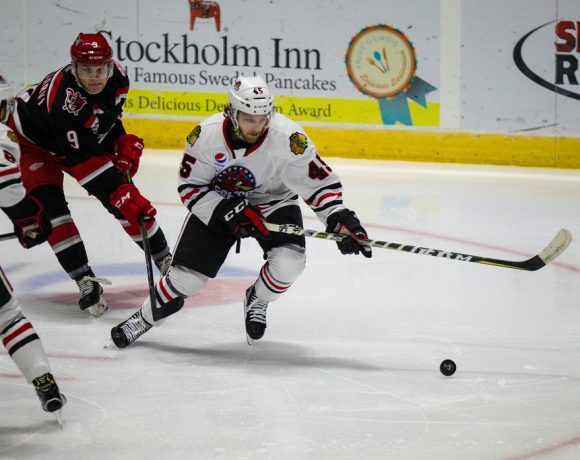 The IceHogs still have home-cookin’ ahead of them through this upcoming weekend. They have three division opponents coming in, with the opportunity to keep pushing up North in the standings. There’s the potential of a trade deadline pact that could provide some help in Rockford. Plus, some of the boys currently residing in town are beginning to step up. The Rockford win streak was anchored by solid defense and some outstanding play in net. However, pucks need to get into the net for a six-pack of wins. Johnson (9 G, 8 A), leads Rockford with five game-winning goals this season. He picked up the deciding tally in both IceHogs wins this week. Over the last seven games, Johnson has four goals and a pair of helpers, including two power play strikes. All four of those goals came in Rockford victories. In 42 games, the veteran has 11 goals and 18 assists on the season. Schroeder is on pace to set a career-high in points, his previous high being 44, set with the Wolves in 2011-12. Schroeder ran his current point streak to five games and has seven points (2 G, 5 A) in his last eight contests. With several injuries on the blue line, the rookie has continued to contribute at both ends of the ice. With eight goals and 17 helpers in 47 games this season, he is a lone assist from tying Darren Raddysh as the team’s top-scoring defenseman. In his last seven games, Carlsson has a goal and four assists. I’m throwing Gilbert into this bunch mostly because of his outstanding evening on Saturday night. Even before the big rookie notched what was a game-tying goal at the time, I was impressed with how aggressive his was in the offensive zone. Gilbert sent a personal-best five shots on the Tucson net Saturday, just missing on a couple of attempts and following up on several rebounds. He has 45 shot on the year in 39 games. In his last 15 games, however, he has put pucks on goal 24 times. A very nice pass by Gilbert set up Johnson’s eventual game-winner Friday to go with his strong showing the following night. Gilbert may be benefiting from increased responsibility in lieu of several Hogs defenders out of commission at the moment. The former Notre Dame skater has consistently brought a hard-nosed style to the ice this season. Gilbert is not a puck-moving type by any means. However, if he can display just a bit more of the aggressive game he showed Saturday on a regular basis, he could be an exciting player to watch. Last Monday, forward Matheson Iacopelli was assigned to the Indy Fuel of the ECHL. 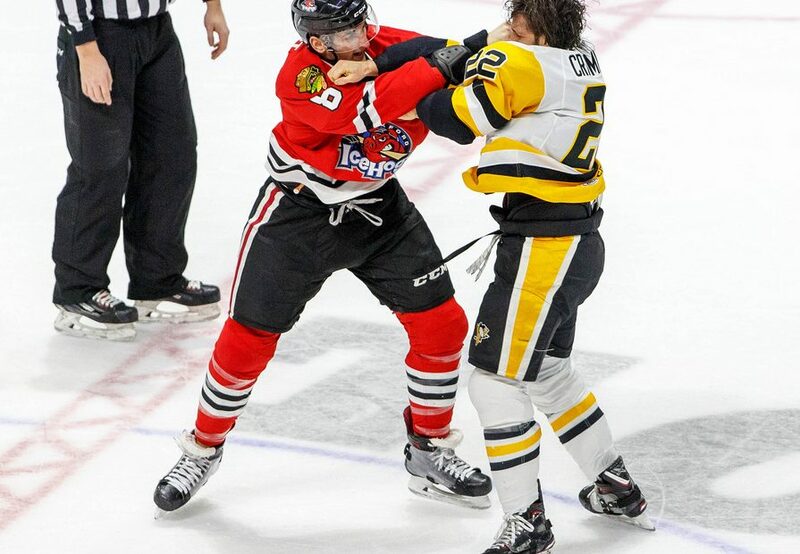 Iacopelli, a third-round draft pick in 2014 for the Blackhawks, had a goal for the Fuel Saturday night in a 5-4 loss to the Quad City Thunder. At times, Iacopelli has displayed a high-quality shot from the left side. This season, he has again failed to get solid footing in the IceHogs lineup. With his rookie contract set to expire this summer, it’s hard to see the young man back in the organization. Several IceHogs defensemen are still nursing injuries. Blake Hillman, who took a nasty turn into the end boards February 1, was proclaimed to be okay the next day by the coaching staff. Hillman, however, has not played since. He skated in warmups Saturday night but was still a scratch. Also scratched Saturday was D Joni Tuulola, who did return from injury the previous night. Brandon Davidson has not played since January 21, missing the last seven games. Luc Snuggerud, who has missed three months with a concussion, may be at a crossroads in his hockey career. It was reported by theathletic.com’s Scott Powers yesterday that the Blackhawks have placed Snuggerud on unconditional waivers. Snuggerud, a fifth-round selection in the 2014 NHL Draft, also missed a sizable chunk of his rookie season with a concussion. After putting up 5 goals and 12 assists in 40 games last season, Snuggerud had appeared in just four games this season before suffering his current injury November 6. 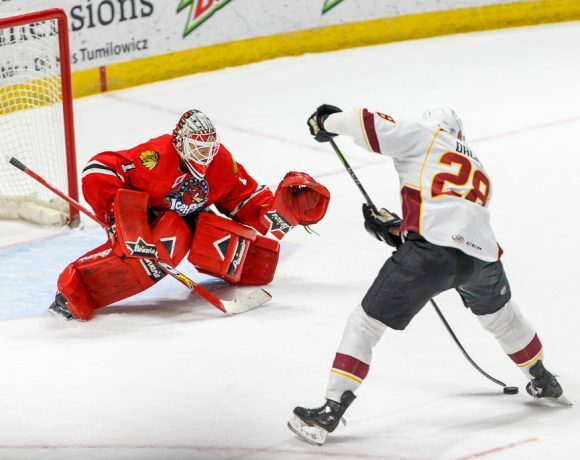 Rockford won its fifth-straight game with a pair of first-period goals, riding a fine night of goal tending by Anton Forsberg to the victory. Local product Josh McArdle got the Hogs on the board with his first AHL goal just 1:42 into the contest. The play developed after Viktor Ejdsell sent a shot on goal from the high slot. The rebound was fought for in front of the net by Jordan Schroeder and Nick Moutrey, who sent the puck back out to the slot. McArdle pounced on the opportunity, knocking the biscuit past Penguins goalie Anthony Peters for a 1-0 IceHogs lead. Just over a minute later, Jarrett Burton beat Darren Raddysh to a Ryan Haggerty pass, leading to a breakaway goal that tied the game. The IceHogs got the game-winner 12:49 into the first, however, converting on a 5-on-3 power play. Lucas Carlsson had won a battle for the puck behind the boards after a Raddysh attempt was wide of the net. Dylan Sikura gained possession in the corner, skated it back up top and sent a pass to Luke Johnson at the bottom of the left circle. Johnson didn’t get all of the one-timer, but the shot found its way past Peters for a 2-1 Hogs advantage at the 12:49 mark. That lead held up for the remainder of the game, largely because of Forsberg. Rockford was out shot 39-13 in the final 40 minutes, but the IceHogs goalie was up to the challenge. Fittingly, Forsberg was named the game’s First Star for his 45-save performance. Late in the first period, Rockford opened the scoring on a transition goal set up by a long cross-ice pass by Jordan Schroeder. The pass found the stick of Jacob Nilsson, who skated the the left dot before hitting Anthony Louis at the opposite dot for the one-timer. The goal came at the 17:38 mark. The Hogs lead doubled 6:27 into the second period after Dennis Gilbert gathered in a loose puck in the Rockford zone. The rookie defenseman slid a stretch pass to Luke Johnson as he entered Tucson ice. Johnson skated to just outside of the right dot before letting fly with a shot that bested the glove of Roadrunners goalie Adin Hill. Tucson’s Lane Pedersen knocked home a rebound past Hogs goalie Kevin Lankinen later in the period to cut the lead to a single goal. However, the rookie net-minder would not allow another puck past him on this night, stopping 23 shots to secure the victory. Meanwhile, the IceHogs picked up a late insurance goal when Nilsson caught cord on the power play, drifting across the slot and flinging the puck past Hill at 15:09. The Hogs put together a rally in the third period from two goals down, tying the game before ultimately losing to end a six-game winning streak. Rockford took a 1-0 lead 8:19 into the game with a power play goal from the top of the left circle by Lucas Carlsson. With time running out on the man advantage, Carlsson sent a Darren Raddysh feed past Tucson goalie Adin Hill. The Roadrunners quickly responded, tying the game 25 seconds later on Brayden Burke’s ninth goal of the season. New pickup Jeremy Gregoire made it a 2-1 game at the 11:22 mark. Five minutes into the second period, Robbie Russo got a shot past Hogs goalie Anton Forsberg on a power play. Rockford faced a 3-1 deficit heading into the final frame. The IceHogs comeback hinged on a roughing penalty by Tucson captain Dakota Mermis, who was called for his mugging of Hogs forward Jacob Nilsson. Rockford took advantage, with Jordan Schroeder catching the top corner of Hill’s net 10:28 into the third period. Less than a minute later, the Hogs came up with the equalizer. Alexandre Fortin drove into the Roadrunners zone and sent a shot off of Hill’s pads. Dennis Gilbert, who had four previous shot attempts turned away, punched in the long rebound from the left circle and drew Rockford even at 11:08 of the period. Unfortunately, a penalty on the Hogs side proved to be the turning point of the contest. Andreas Martinsen somehow avoided a boarding call on Mermis before shoving him to the ice. Martinsen was sent to the box for interference at 15:55; near the end of the subsequent power play, Russo banged in his second goal of the evening to give Tucson a 4-3 lead. An empty netter 30 seconds later sealed the fate of the IceHogs. The Hogs are back at it Tuesday night in Rockford, when they host the Texas Stars. Iowa visits the BMO on Saturday night, followed by a game with San Antonio that will close out this lengthy home stand. Follow me @JonFromi on twitter for thoughts and updates on the IceHogs all season long.